We’ve got serious snow on the ground and temps which are destined to see below zero this week, but Will and I are hard at work planning our next year’s gardens. Like many of you, we’ve been getting seed catalogs in the mail. To avoid missing out on some new listings of rare seeds I’ve been ordering a few things. Not only do we raise food to eat and put up, but we also raise food for our seed business as well. We grow a lot more varieties than we offer in our catalog and on our website because not all meet our requirements: productivity, taste, and hardiness. This year we grew 27 different bean varieties; some we loved, some not so much, and a few were really rare varieties. 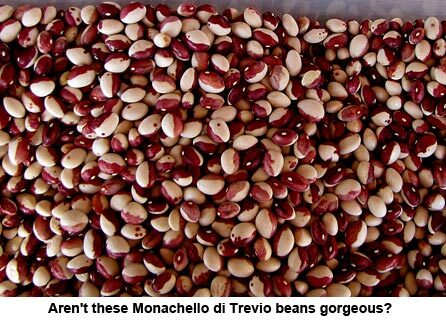 Take Monacello di Trevio for instance — I paid $4 for 10 seeds of this gorgeous red and white shiny round bean. It was supposed to be a bush bean but I soon found out it was a pole variety. Will almost had a heart attack when I paid forty cents a seed for beans! But those 10 seeds produced more than 4 pounds of beans. They tasted great, shelled easy, and produced well. Not enough to offer yet, but you can be sure I will be planting many more next spring! Nothing warms you up more than sitting with a seed catalog making plans!!! Those beans sound awesome! Seed prices sure can be heart attack material. I paid $4 for a package of 20 beans from a very well known high quality and specialty organic seed supplier that were supposed to be pole Borlotti. The package directed me to build a very sturdy trellis at least 6 feet high, which I dutifully did. The seeds had an 80% germination rate, were bush and about 12 inches tall, not pole, and produced a very scanty crop that may give me two meals, although the flavor is outstanding and they look like Borlotti. I’m now looking for a short season real Italian Borlotti. Things should be better next year. Gardeners are such hopeful people. The Seed Savers Exchange Yearbook is amazing. No matter what the item is (except maybe short season Borlotti) someone somewhere is growing it. I am hoping for seeds of William Woys Weaver’s Pepper Pot pepper. Those beans are beautiful! Will look forward to when they’re on the ‘sell list’. Thanks for the update!